In the Bible when a person changes his name it also changes his spirituality. He also changes his identity. For example Abram changed his name to Abraham. In the New Testament Saul became Paul. And as our church progressed so is our faith and also our identity. In 2010 our other affiliation was CUC or the Christian United Church, after which it was changed to AOCC or the Apostolic Old Catholic Church. Our local church council and our congregation after much prayer and deliberation voted for our new name, our new identity. We followed the example of our Christian ancestors when they named the first churches in the New Testament in the Greek language as the EKKLESIA TOU THEOU or the CHURCH OF GOD in English. 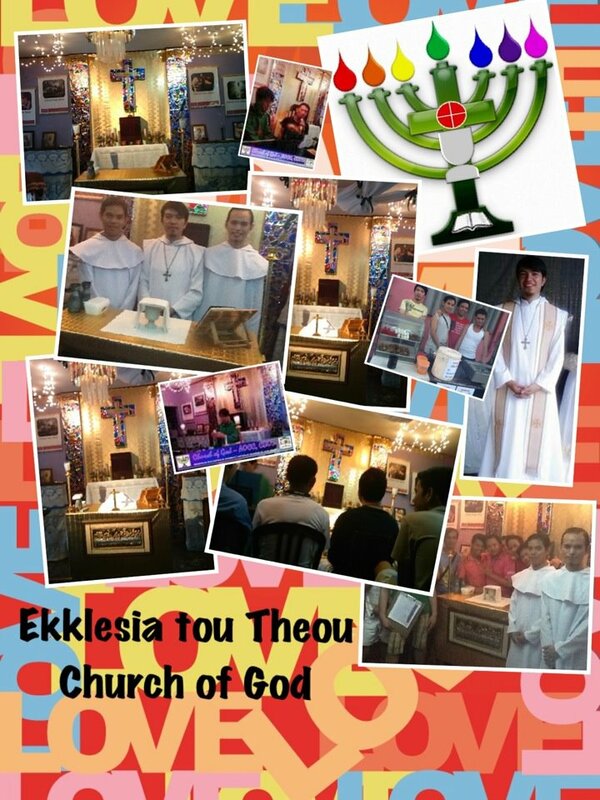 From now on our church will be called in its original form the EKKLESIA TOU THEOU or the CHURCH OF GOD. Our church will also be under the care and jurisdiction of the Catholic Diocese of One Spirit Philippines through our bishop Richard Mickley and our Archbishop Jim Burch. Our church will be open to ecumenical affiliations, communions and partnerships with all independent churches with valid apostolic successions and also with all churches that are welcoming, inclusive, uniting and non discriminating. First COG Homoseminar was a huge success. Praise the Lord. Is there a God? Mayroon bang Dios? Bishop Richard Mickley: The man who started it all. Dapat nga ba nating ipagdiwang ang pasko ayon sa Biblia?